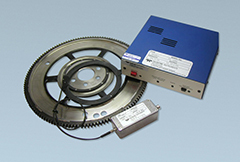 Teledyne Instruments - Test Services (TTS) has developed a Non-Contact Torque Sensor to address the challenging application of measuring automotive engine torque. This was accomplished by customizing and instrumenting the Flex Plate or Flywheel which connects the engine crankshaft to the torque converter. The resulting high quality, dynamic torque signal allows the automotive development engineer to understand the actual engine output before it is damped by the torque converter. This data can be used to examine engine harmonics or filtered to obtain an average value for engine and transmission development purposes. The FPT100D system can be very helpful in the development and confirmation of ECM torque algorithms. Many clients are using a unique adaptation of the FPT100D to measure torque paths in hybrid powertrains.